Statement of the school’s philosophy (noun phrase) a text to describe the philosophy of the school to explain what they believe in, etc. Academic calendar (n. phrase) the calendar of the school indicating when school starts, which days are off, when the holidays start, etc. 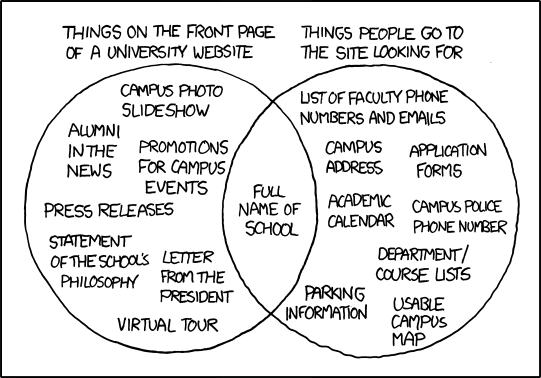 Since there is only “full name of school” in the common category, this comic is making fun of the fact that there is a big difference between what universities promote on their website and what users look for when they go on the website of the university. Universities generally try to promote things that will make the university look good; while people who visit the website are usually looking for practical information. You will probably find this comic strip quite funny if you yourself have been in the situation when you go on a university’s website to look for something listed on the right side to only see on the website what’s listed on the left side. This presentation format with the circles is called a “Venn diagram.” This is a practical way to efficiently present information. alumni, front page, press release, site, slide show, university, Venn diagram, virtual tour, website. Bookmark.